Ville Laaksonen (born 1978) is a visual artist, curator and critic working in Turku and Helsinki, Finland. He’s contemporary esoteric works open gates, doors and windows to visualise heaven and hell on earth - and an aesthetic view on life through the vision of an idealist in beauty. Embracing spirituality life reveals its significance in its unique and delicate ways. Laaksonen was stipendiate for the Union of Finnish Art Associations 2012 and exhibited in Varkaus Art Museum. At the same time Laaksonen had also been invited to exhibit in Artchapel, Turku and nominated as the curator for the Paulo Foundation Annual 2012. Laaksonen works actively on Finnish art scene and he has worked on several trusted positions. He is a member of Helsinki and Turku artists associations, Arte organisation and SKY, The Finnish Society for Curators. 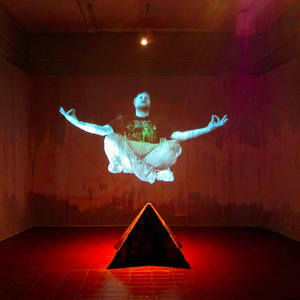 Laaksonen has exhibited in several solo and museum exhibitions. 2007 Goldener Kentaur - competition, Kuenstlerhaus, Munchen, Germany.